This Imagine has several features you didn't even know you would need. There is bedding for five, plus three more campers if you fold down the booth dinette, tri-fold sofa, and bunkhouse sofa. The kiddos will have to draw straws for their choice of bunk bed. Just imagine the cook making meals inside with full kitchen amenities and a flip-up countertop extension, or outdoors on the outside kitchen while watching the kids run around the campsite. You can even bring your pets to enjoy the pet dish drawer. 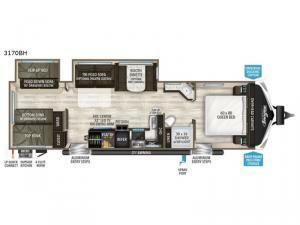 There is a 32" LED TV, a walk-through bath for added convenience, and much more to enjoy with your family! 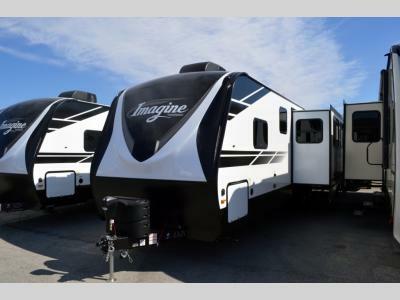 Now imagine you own this trailer and what fun you will have!